It is a typical and unfortunately quite popular way of introducing the concept of energy in a very obscure way. The problem with such an approach to the concept of energy is that one is trying to convey one of the most important feature of the concept, before even trying to provide a hint about what should be measured or calculated. Quite a pity for an experimental science! I strongly advise you to skip for the moment that paragraph, go ahead, try to grasp a first idea about the content of the whole chapter, and then you can go back the this second paragraph with some possibility of assigning some meaning to it. Just to provide you a trailer of what you could find in the next pages, presumably the author will introduce a couple of scalar quantities, named potential and kinetic energy, both depending on the instantaneous configuration of a system and it will be shown that any change of each of them is always accompanied by an opposite change of the other. Probably some chapters after, it will be shown that the same concept may be extended to deal with much more complex physical systems like fields, macroscopic objects with invisible atomic elementary units etc. In my opinion, anticipating so much the result is not very useful from a pedagogical point of view. 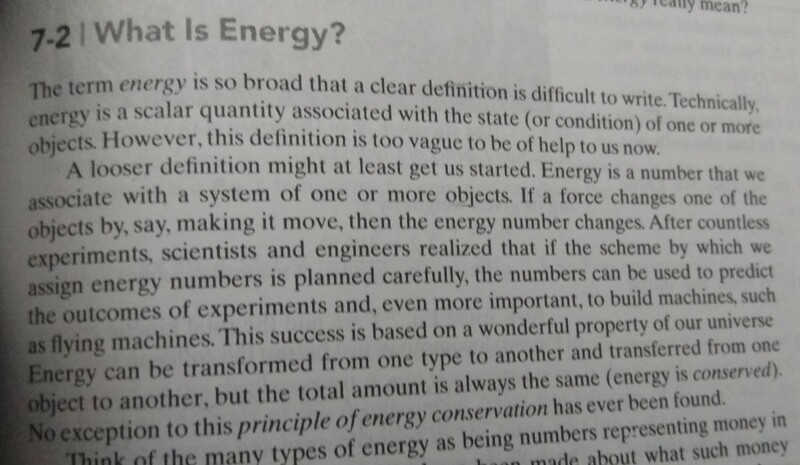 The second paragraph tells us about how abstract the concept of energy is but also how naturally connected it is to the universe. The author is trying to convey that energy is some sort of a number that one can calculate using certain formulas (like $\frac 12 mv^2$ for Kinetic energy or $mgh$ for Gravitational Potential energy) for objects in the universe, and that it has many forms in nature, but for some reason quite unknown to us, nature always tends to keep the total energy of the universe constant. You can convert energy from one form to the other, but never create or destroy it. This is what the author refers to as "wonderful property of our universe". Formally it is called - The principle of conservation of energy. Not the answer you're looking for? Browse other questions tagged thermodynamics energy energy-conservation or ask your own question. Understanding a graph of energy conservation with bounded and unbounded motions? Conventions and realities of kinetic energy? What are the “inexact differentials” in the first law of thermodynamics? Why is temperature of a system an intensive property whereas internal energy is not?